All the stories are good and enjoyable, they could all perfectly be standalone pieces preceding an entire novel. Some of them are more serious and really mess with your mind, making you wonder and ask questions. You want more. Others are funny (in a very macabre way, of course) and some of them give you a very different vision of what a "hell on Earth" could become. It's a book that, depending on your capacity of absorbancy of "Horror" you'll have to close it every now and then to have a breath. I read it all in a row and I can tell you it affects you. It's an amazing read. The awesome cast of authors and the perfectionism of Death's Head Press —delivers. And delivers an amazingly terrifying amount of horrors right to your hands. I have two favourite stories, I won't tell you which of course. It's extremely difficult to choose though, because all of them have something very special that plants a seed in your mind. I don't think you are going to forget these "theories of Hell". 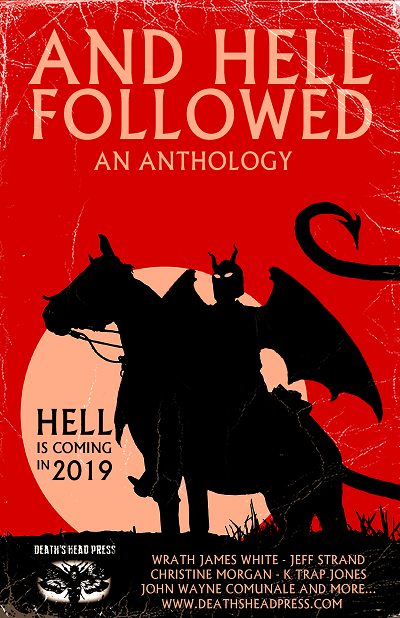 When you expect it the less, something will remind them to you, and for an instant, Hell will take its place into your thoughts, courtesy of all these authors —for your dark delight.